Featherweight may be one of boxing’s smallest weight divisions but it has always been big on talent, notably in Britain. Since ‘Peerless’ Jim Driscoll ruled the ring back 1906 there have been more than 70 who have held the British title, a good couple of fistfuls of whom have fought and won at world level. It is probably the nation’s most productive division. The nine-stoners have produced some of Britain’s most ferociously-contested, most entertaining and skilful battles and the feathers are certain to fly again when the two current best of British, new IBF belt holder Josh Warrington and two-weight champion Carl Frampton clash in Manchester on December 22. I rate both in my all-time British top ten feathers but the competition is fierce with illustrious figures such as Naseem Hamed, Howard Winstone and Barry McGuigan all jostling for places. And I take into account their impact on the sport and popular appeal as well as their records. 1. Naseem Hamed. The self-styled ‘Prince’ arguably was the best British featherweight of them all, cocky, cantankerous, arrogant but sublimely talented. He held multiple world belts at featherweight in the nineties and while his southpaw style was fast and flashy, his punching could be brutal. He would certainly figure highly in any world all-time list. 2. Howard Winstone. Another ‘Prince’ of pugilism, this time of Wales. The Merthyr magician thrilled us with his artistry in the sixties, using mainly his quicksilver left hand as he had lost fingers on his right in a factory accident. After narrowly losing two tremendous contests with the great Mexican Vicente Saldivar he won the word title at the third attempt, defeating Japan’s Mitsunori Seki at the Royal Albert Hall. 3. Jim Driscoll. Like Winstone, ‘Peerless’ Jim, the first-ever British featherweight champ, was idolised for his skills in his Welsh homeland. Boxing his way out of poverty through the fairground booths, Driscoll took the British title by defeating Joe Bowker over 15 rounds at the National Sporting Club n February 1906. He went on to win the Commonwealth title and found fame and adulation both here and in the United States, where he was given his ‘Peerless’ prefix. 4. Barry McGuigan. The Clones Cyclone was to become as renowned for his blarney as much as his boxing. He attracted an enormous following in the mid-1980s, particularly to the King’s Hall in Belfast and became something of a unifying factor during The Troubles. As British and European kingpin he finally got his world title shot against the long- reigning WBA holder Eusebio Pedroza of Panama, winning a unanimous decision in a fever-pitched QPR football stadium in 1985. He was later feted by several hundred thousand fans lining the streets of Belfast on his return. 5. Carl Frampton. As popular in Belfast now as his one-time mentor McGuigan was then – perhaps even more so as he still resides there – Frampton, aka The Jackal, is a former two-weight champion who like McGuigan is articulate both in and out of the ring. His immense popularity stems from his fan-friendliness and he has already achieved legendary status in Ulster. After his solitary defeat, by a majority decision in a world title return with Leo Santa Cruz, he switched to the promotional care of Frank Warren and has been unbeaten in four bouts since, leading to his coming blockbuster challenge to Josh Warrington. 6. Josh Warrington. Not since the ‘Blue Moon’ glory days of Ricky Hatton has there been such a swell of localised support for a boxer in the UK. Leeds warrior Warrington, undefeated in 27 contests, previously held the WBC International, European, Commonwealth, British, and English featherweight titles before his stunning upset of IBF world champion Lee Selby in May of this year. It was a fight I tipped him to win because of the relentless pressure and go-forward gumption he applies from start to finish. I fancy a repeat against Frampton. 7. Nel Tarleton. Although he never won a world title – losing twice in the thirties on points to American Freddie Miller – Liverpudlian ‘Nella’ was a prolific British champion, twice winning the prized Lonsdale Belt outright, one of only seven boxers to do so. Tall and skinny, and lacking a big punch, had only one lung but fought for 16 years until retiring in 1945 aged 42. 8. Duke McKenzie. He was that ring rarity, a three-weight world champion having held the IBF flyweight title from 1988 to 1989; the WBO bantamweight title from 1991 to 1992; and the WBO junior featherweight title from 1992 to 1993. 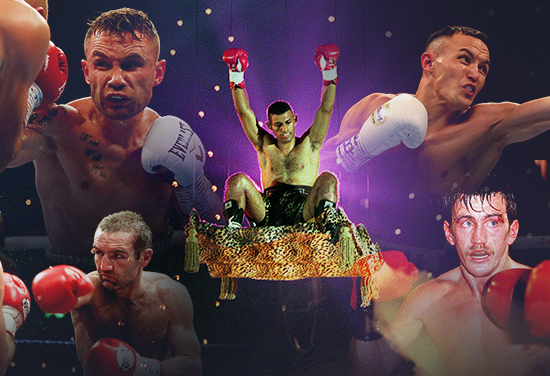 He also held the British and European flyweight crown and was British featherweight champion 1993/94. 9 Scott Harrison. A controversial choice, the Glaswegian was the first Scottish boxer to regain the WBO featherweight championship in a career dogged by problems with depression and alcohol. He fell foul of the law on several occasions and had spells in Scottish and Spanish prisons. But as a fighter he was granite-tough, and exciting to watch with a thunderclap punch. 10. Sammy McCarthy. Now Britain’s oldest surviving boxing champion at 87, ever-smiling Sam, the British featherweight champion of 1955-56 became the first boxer to be honoured by the TV programme This Is Your Life and at the time, aged 25, was the youngest subject. He was a stylish crowd-pleaser with tremendous popular support from east London. On the subs’ bench: You could argue a case for several others, not least McCarthy’s protégé, Terry Spinks, along with Steve Robinson, Evan Armstrong, Ronnie Clayton, Paul Hodkinson, Colin McMillan, Lee Selby, Paul Ingle, Ryan Walsh, Bobby Neill and Owen Moran, among others. What an array of featherweight finery. And there’s still Michael Conlan to come!